<@NihabaAshi> Luck trade because I saw something that really wasn't there. <@NihabaAshi> sideline...price action is too fast for me...will just watch for awhile. <+silo> anyone got a realtime chart of TFZ8? (er2) ? for the remainder of the trading day it will be "all out" and no more scaling out. <+rickf> as niha's said many times, rightfully so, "trade first, post later -- work the trade"
<TraderG> KN you entered @ 1224.25 with a SL of 1. ES traded @1223 which is below your stop. Can you explain? <+pat255> & dont reflect on the trade ..
<+TraderG> sometimes you can learn from a mistake of a good trader. but then you have to open your mind. any other q b4 i go? <+silo> yes, will it rain tomorrow? <+TraderG> i believe KN is cabable of speaking for himself. 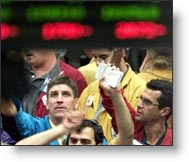 <+TraderG> BREAKOUT we are here to exchange and examine ideas. If you don't like my questions, it is up to KN to say so. KAPICH? <+TraderG> btw breakout, you are here since Aug 22 if I am not mistaken (details again - sorry) what have you contributed to this group so far? <+TraderG> you are welcome to PM me if you want so that we don't waste more time of the group. <+silo> gave teh second half a little more room than normal..
Gotta exploit these types of trading days because that's where the big profits are at. <+szubaark> Yup, nice Volatility today.